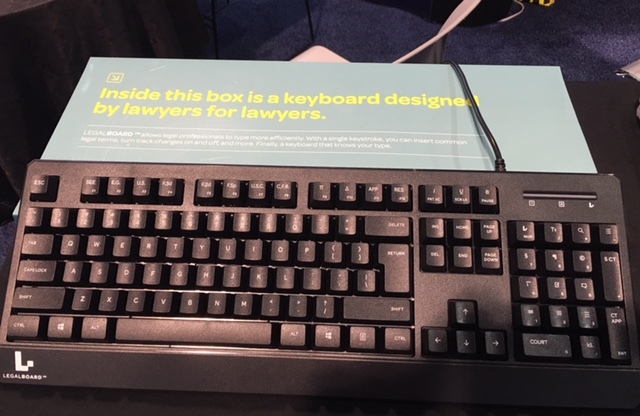 When I became aware of a keyboard made specifically for lawyers, I found myself interested. I didn't think too much about it for the lawyers at my firm, Lowenthal & Abrams, PC, I actually thought about whether it would be useful for our paralegals. As a result, I decided to buy a LegalBoard for one of our paralegals to use in her day-to-day document work. Then, while waiting for my order to ship, I was provided one of the LegalBoards for free in return for writing this review. This means our firm ended up with two of the LegalBoard keyboards. I offered the free keyboard to Caroline McKernan, one of our paralegals. Caroline works for a medical malpractice/catastrophic injury attorney. The keys feel nice to depress and aren’t too sticky or stiff. The bottom row is taller/more proud from the edge than I’m used to and as a result I sometimes find myself accidentally holding down the Ctrl button with the side of my hand. This is something that will change with time. A lot of the special legal functions are on the number pad, and so far I often forget to toggle off the special functions before I try and use it as a number pad (for dates, citations etc) which causes silly output issues. I have gotten more used to this the more I use it, but it still occasionally trips me up. Some of the legal functions are more geared toward appellate and/or federal work, and so are not of the greatest utility to me. This is because our cases aren't generally super brief-heavy. Paralegals and attorneys with brief-heavy work would find this very useful. Caroline's assessment, in the end, is that the keyboard has some useful features, but she doesn't think she would want to spend this amount of money on it. In other words, while Caroline liked the keyboard, she did not feel it would be worth the price for the work she does. I have to agree that the cost of the keyboard is quite high when compared to standard keyboards (the LegalBoard retails for $65) and I am not sure that I believe that its cost is worth the potential time savings for the paralegals at our firm. But I can tell you that the keyboard is well constructed and solid, much more so than the average $25 device you’d find online or at your local big box store. If you produce documents that consistently use the specialized symbols that are common in some legal documents, you may well find that the value of having keys dedicated to these symbols contained within a well-constructed keyboard is worth the cost. If you are interested, I recommend that you do what my firm did: buy one LegalBoard and see what you think before you invest in new keyboards for everyone. Jennifer Ellis is an ethics and legal malpractice attorney with the Philadelphia personal injury firm of Lowenthal & Abrams. She also manages the firm’s online presence. In addition, Jennifer serves as a law firm marketing consultant under the name Jennifer Ellis, JD. She assists lawyers with social media, websites, SEO, law firm technology and more. She is a nationally recognized speaker and writer on subjects including ethics, social media, law firm technology, law practice management, websites and marketing. Find Jennifer online at jlellis.net, lowenthalabrams.com and @jle_jd.